I love these little quiches for picnics and summer parties. They are great to take along anywhere. They can be served warm or cold. The crust is a combination of zucchini, rice, egg and cheese. The filling for these is made from bacon and tomato- but I have vegetarian filling options listed at the bottom of this post. So simple and cute, too. While the recipe makes 12, I find I can usually get a few extra out of a recipe. They freeze well. Combine ingredients in small bowl. Set aside until ready to use. Place in medium bowl and whisk together until smooth. Grease 12 muffin cups. 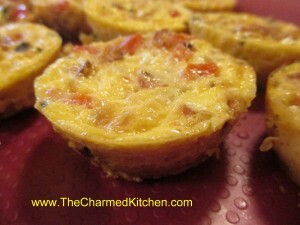 The mixture will fill 12 cups very full- but you can make your quiches a little smaller, if you like and make a few more. Pat 2 tablespoons of the crust mixture into each muffin cup. Bake in a 350 degree oven for 10-12 minutes. Cool before filling. While baking and cooling crusts prepare filling of your choice and custard. Spoon 2 tablespoons of filling over each cooled crust. Spoon about 3-4 tablespoons of the custard over the filling. Bake in a 375 degree oven for 15-20 minutes. Can be served warm or cold. In 1 T. butter, sauté 1¼ c. sliced mushrooms, ¾ c. chopped fresh broccoli and 1/3 c. diced onion. Cook until tender, cool. Stir in 1 C. shredded cheddar cheese and 1 tomato, seeded and diced. Combine 1 10 oz. package frozen spinach, cooked and drained well, with ½ c. diced onion and 1 c. shredded Swiss cheese and ½ c. diced sweet red pepper.